Patrick is joined by Mike White of The Projection Booth podcast to discuss a frustrating sequel, roller-skates and their own terrible addictions to Nuke. Hear more of Mike White on The Projection Booth and follow them on Twitter at @ProBoothCast. Check out more of Mike's work at Impossibly Funky! I was one of the other ten people to see Idiocracy in its original run. But don't applaud too loudly: I can also say the same about Postal. When I was a kid, I was only able to watch the 10 minute or so final battle of this movie. My father said the movie was too violent for my little mind to handle (I was a fragile child), but couldn't deny his only son the opportunity to watch a battle between two cyborgs. So, he used one of our three (yes, three) Betamax players to tape off that small segment of the film so I could watch it again and again. 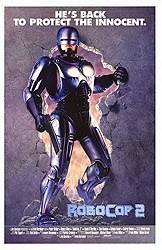 For the longest time, Robocop 2 was a really neat short film. I have a similar story about the ED209 fight in the first Robocop and the first half of Little Shop of Horrors. What happened to Mark Ahn doing this podcast (as was advertised on the "Robocop" podcast a few years back)? Anywho, terrific podcast gents. Patrick is right that "Robocop 2's" only worth today is (a) making the first "Robocop" look even better and (b) an embodiment about everything that's wrong about an unnecessary sequel. But you can still be an unnecessary and totally generic sequel to a superior movie and be entertaining. "Predator 2" came just a few weeks apart from "Robocop 2" (both summer sequels to 1987 blockbusters), and as flawed and gratuitously violent as the former is (as much if not more than "Robocop 2") it commits to its vision and entertains while the latter just meanders, annoys and puts off viewers. Don't get me wrong, "Predator 2" is no undiscovered masterpiece or equal to "Robocop" or the first "Predator." But hearing Patrick and Mike pile the (rightful) ire at "Robocop 2's" nihilism makes me wonder why I don't feel the same way about "Predator 2" when they're both summer of 1990 kissing cousins. I know it's a bad movie, but Robocop 2 is always a movie that I've really, really liked. It's probably because I actually saw 2 before 1, so I wasn't disappointed by it. But I do think all the RoboCain stuff is really well done, I love the stop-motion. And there are quite a few lines that I love (I disagree btw, about the "doesn't he look scared?" line, I think it's chilling.) There's a really great line at the end, where Cain is killing everyone outside the press conference, and the Old Man goes to the window and says "This could be bad for OCP Johnson, get your best spin team on it!" It honestly makes me laugh every single time. I agree with the majority of this especially the inclusion of the young child. I feel the frustration of the fact maybe they could've made that work but they didn't explore it! It was very fun though being able to watch this and delve into my problems with it by way of listening to you guys. Great as always. Patrick used the word that always comes to mind when I think of this movie: mean. Everything about this film is so mean-spirited it's almost depressing at times. It starts in the opening scene when the poor guy gets his eyes stabbed out by the woman's heel. I mean, really! You guys totally hit it on the head in that there are at least 5-6 things going on in this movie, and maybe 3-4 actually have potential. You're also right that Tom Noonan "saves" (I use that word very loosely) the film because in the hands of a lesser actor, there would be nothing worth watching. This is a completely random observation that may only be interesting to me. Certainly Nolan has been doing this among others for a while, but might this be the first (at least mainstream) movie to have a completely cold opening? I'm trying to think of one before it, and I can't. Just one of those things that struck me the last time I watched it. I think most Bond movies have what I would call a cold open. From Russia with Love and For Your Eyes Only, in particular. Yikes. I would like For Your Eyes Only so much better without that cold open. "Apocalypse Now" also opens with a cold open w/o credits. In fact, based on the version you're watching "A.N." might not even have credits at all (except for a copyright notice at the very end), something that I can't recall any other movie doing before or since. I've decided to delve deep into the Fthismovie podcast catelogue finally getting to those movies I haven't seen....and as a sweetener I have the podcast waiting for me at the end of it! Heading all the way back to 2014 here and I gotta say, Patrick, 2016 doesn't look like its the year for a Robocop 2 re-evaluation. You guys were so right - it highlights everything that was good about the original just by virtue of how bad it is. I'd already seen the Robocop replacement fails scene a few times before and always had a giggle. Even now after seeing it that part is still the highlight.